Richard Strivens gave the flute ensemble the opportunity to delevop their stagecraft skills at a workshop held in September. The flute ensembles (Salad, Pastilles and Punch) rehearsed and refined their skills in walking on and off stage, acknowledging and engaging with their audience. In fact, any aspect of performing not to do with the notes and interpretation were discussed and explored. The performers all enjoyed Richard's company and learnt a lot from the session. Future performances, whether solo or ensemble, will be enriched by the skills developed and practised at the workshop. Thank you to Richard for inspiring the group and for an enjoyable evening. (Richard Strivens, bass-baritone, originally from Kent, grew up in Belgium and graduated from Oxford University in Chemistry. He studied singing at the National Opera Studio, the Royal Northern College of Music and EurOperaStudio, Milan). 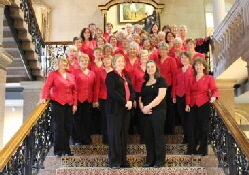 Ladybrook Singers made a welcome return to Buxton Festival Fringe at the Methodist Church on Saturday night with 'A Musical Cocktail'. An appropriate title if you take my dictionary definition of cocktail 'any combination of diverse elements'. As with any cocktail cabinet you have stock ingredients so you do with a concert. Here we had an experienced choir with a guest instrumental ensemble with the ad ded dash of a solo performance.